This is an achievements guide I have made for the beautiful game Shadows Peak by independent game developer Andrii Vintsevych. These achievements require you to complete the game in a certain way. This achievement is story related and rewarded automatically by completing the game. Finish the game without taking any fall damage or stepping into a bear trap. This achievement has to be done within one playthrough. It isn’t too hard if you save a lot. Every time you take fall damage or accidentally step into a bear trap, quit to main menu and reload your last checkpoint. Bear traps can be neutralized if you stand right beside one and press ‘E’ to interact with it. Finish the game without using medkits or pills. This achievement has to be done within one playthrough. You can’t use any of the red medkits which you can find on the island, nor the pill bottles (like the one which can be found near the trailer left of the starting point of the first chapter). You can however use the Native American healing stones of which you can find one in each chapter. If you accidentally take pills or a medkit, quit to main menu and reload your last checkpoint. This isn’t as hard as it seems, because your health regenerates slowly during walking around. Fast health generation can be achieved by killing humans (in the first chapter) or aliens (in the second chapter). Finish the game without firing a single shot. If you go for this achievement, you get the Bloody blade achievement automatically. At the start of the second chapter, you get a rifle which you cannot use at all if you want to get this achievement. So, switch directly to your knife at the start of the second chapter for hunting animals and killing aliens. 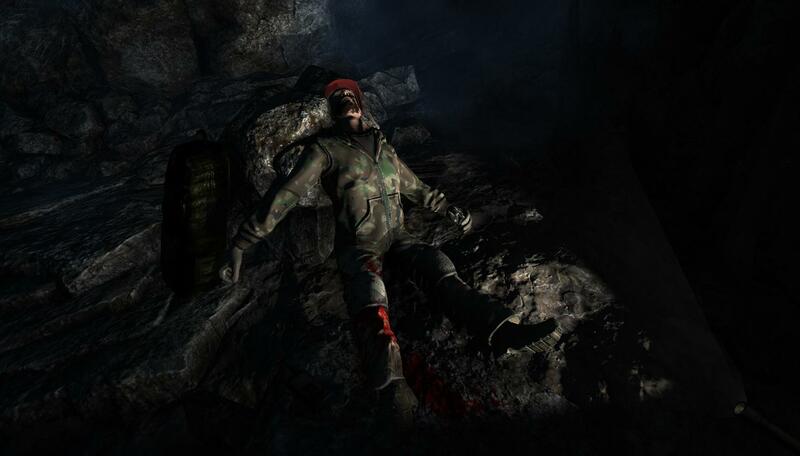 The knife is not a strong melee weapon however, so it is advisable to get a stronger weapon as fast as possible: the axe which you can find sticking out of the wall of the trailer with the empty engine inside on top of the hill with the fire tower on it. To make this achievement easier, it is good to know that the regular aliens and the Beast cannot hurt you if you crouch by pressing ‘Ctrl’. So while they try to attack you, you can easily take them out with the knife (slow) or the axe (fast) while crouching. The psy aliens that appear after killing the Beast can however NOT be killed with a melee weapon, so you just have to run in the opposite direction when you encounter these aliens. This is why this achievement can easily be combined with the achievement Fast runner. Finish the game without using save crystals. Easier than it sounds. Can easily be combined with the Survivor achievement. Note that you can save your game at any moment in the first and second chapter without using the save crystals. You can do this by entering and exiting the caves (the game saves automatically when you do so). Progress will also be saved automatically at different points in the story. Just remember to NEVER interact with one of the red crystals if you want to get this achievement. One of the harder achievements, because when you die somewhere in the game, you lose your chance of achieving it and have to start over again. Can easily be combined in one run with Unsaved, because you don’t need checkpoints when you don’t die. It is advisable to not combine Survivor with getting collectibles, because without looking for collectibles you don’t have to visit all locations on the island, thus increasing the chance of getting off the island alive. In the first chapter, get the knife as quickly as possible, so you can kill the dog guarding the cave entrance and the man with the spade who tries to kill you in the vicinity of his minivan. To do this, you have to go to the two houses near the coast line to the right of your starting position. In the house on the right side you can find a knife sticking out of a police officer in the left room of the upper floor. The black shadows can’t be killed, but can easily be avoided. Just walk in the other direction when you encounter one. One encounter with a black shadow won’t kill you, but it will empty half your health bar. Regenerate health by killing humans, collecting medkits, pills or touching the Native American healing stone. Try to avoid snakes or kill them with your knife. In the second chapter, you can be killed by black shadows (though there are way less of them than in the first chapter), the different animals, the Beast or the aliens. Use your rifle to shoot enemies from a distance, increasing your chance of survival. See the descriptions of the Liberal and the Clear head achievements for tips on how to deal with the different enemy types as safely as possible. These achievements require you to complete certain actions in the game in a special or difficult way. Use save stones more than 40 times in one playthrough. Very easy. Just use the save stones as often as possible (you can also use the same one again and again) and after using save stones 40 times, the achievement will unlock. Don’t let the black shadows hurt you. Not too hard. Just flee from the black shadows you encounter to make sure they can’t hurt you. When you do get hurt by one, quit to main menu and reload your last checkpoint. There are lots of black shadows in the first chapter, but in the second chapter not so much. Avoid taking any damage from Xaphan. For this achievement, you can’t take any damage from Xaphan. Xaphan is the possessed teddy bear on fire that functions as the first boss of the game. You encounter this boss in the cave in the first chapter. You can avoid damage best by walking back and forth between the main area of the fight and the small room to the side of this main room wherein you can find the vines which have to be burned by the teddy bear to open up the water area in which the teddy bear can be drowned. Every time you take damage, quit to main menu and reload your last checkpoint, starting the fight over. Lure an enemy into a bear trap. Easiest way to achieve this is by luring one of the many aliens that follow you in one of the many bear traps in the second chapter. If you find a bear trap, don’t deactivate it, but remember its location so you can lure an alien to it later on. Kill the beast using melee weapons only. Can be achieved in one go with the achievement Liberal. See the decription of that achievement for more details. To get this specific achievement, you only have to kill the beast using melee weapons. Don’t kill any psy aliens. The psy aliens are the ones that appear in the final section of the game after killing the Beast. These are the aliens that crouch on the ground and use lethal static to kill you when you get too close. Just run away when one of them gets too close instead of attacking them. They don’t move too fast, so it’s not that hard avoiding them. The psy aliens are the ones that appear in the final section of the game after killing the Beast. These are the aliens that crouch on the ground and use lethal static to kill you when you get too close. You can kill a psy alien by shooting it five times with the rifle. The rifle is too slow to do this standing in the same spot without dying, because when the psy alien gets too close to you, you die because of the static it sends your way. So every time you hear the sound of the static increasing, run a little further away from the psy alien and continue shooting it. This has to be done to all six psy aliens which are scattered across the map. Just follow the main paths and you’ll find them all. These achievements require you to collect something in the course of the game. In the first chapter, enter the church which is on the far left of the island as seen from your starting position. After entering the church, read the Bible on the pedestal. Find the book of the dead. In the second chapter, you'll enter a cave where you have to follow the Beast after initially fighting it outside. At a certain point in this cave, you have to fall down in a pit with several levels of wooden planks to get to a lower point. However, before you do this, jump over this pit to the other side. The easiest way to do this, is by hugging the right wall. If you fail and fall down, just quit to main menu and reload your last checkpoint. When you reach the other side, climb to the top of the room, where you will find the Necronomicon. See the vision of the future. In the second chapter, you’ll find a pier with a checkpoint under the water surface. This is where the lake is at its widest. From this underwater checkpoint, you'll see a sunken UFO closeby with a glowing light underneath. Swim to this glowing light to get underneath the UFO, where you will find a glowing orb, giving you a vision of the future after interacting with it. Use every key in the game and enter all places blocked by planks or roots. The left one of the two houses to the right of your starting point near the coast line. The key to the left house is in the mailbox. The cabin near the house on top of the hill. The key to this cabin can be found in a backpack to the right of the lighthouse. To enter places blocked by planks or roots, you'll have to get the axe first. You can find the axe sticking out of the wall of the trailer with the empty engine inside on top of the hill with the fire tower on it. The trailer on the top of the hill can be entered by axing the planks on the roof. Afterwards, you can open the door from the inside. The fire tower on the top of the hill can be entered with the key you receive after defeating the Beast. The gates surrounding the radio tower on top of the hill can be opened by chopping up the roots blocking them with the axe. Inbetween the cave entrance which is initially blocked by rocks but later opened by the Beast, and the top of the hill with the fire tower on it, is a hidden room blocked by planks. Chop these planks with the axe to enter this room. You'll find a save stone inside. After the cave entrance is opened by the Beast, enter the cave. Directly to your left a passage can be found which requires chopping down the planks blocking it with the axe. After you defeat the Beast, you receive a couple of keys. One of these opens the back door of the cave, which you reach directly after defeating the Beast. The farm where you find the wolf can be entered with a key, which can be found on the dead body of the farmer directly in front of it. Inbetween the farm and the spot where you can cross the river without swimming are two hidden passages in the left wall. One has a few planks blocking the entrance only partially. In this hidden passage is a box which can only be broken by axing it. Read all books, notes, and papers. The paper on a chair in front of the trailer near the coast line (to the left of your starting position). The paper in the left one of the two houses near the coast line (to the right of your starting position). The paper in the right upper bedroom of the right one of the two houses near the coast line (to the right of your starting position). The cell phone you can find in the same room as this paper. The bible in the church (see the description of the Black Mass achievement). A note in a bottle on the beach near the dead whale. The cell phone in the pocket of the killer with the shelf. The location of this killer is near the church in a small area with trees. You'll find his minivan of which the alarms go off when you get too close. This is when the killer will try to attack you if you don't kill him first. Loot him after killing him to find his cell phone. The whiteboard with information in the cabin of the dying man. The laptop in the same room. The book in the same room with the title ‘Third eye’. The paper in the house on the hill. The occult book on the table in the house on the hill. The note next to the walkie-talkie in the house on the hill. The occult book in the closet of the house on the hill. A note inside the backpack of the dead man in the Shadows Cave. The book written by the missing author in the caravan. The paper beside the coffee cup in the caravan. The cell phone in the green car in the same area as the caravan. The Necronomicon book in the cave (see the description of the Necronomicon achievement). The note in the farm house in front of which you kill the wolf. The cell phone of the corpse you can find in a hidden passage on your left on the path between the farm house where you kill the wolf and the Native American healing stone. The paper in the tent on the camping site on the right shore of the river. The cell phone in the backpack you find on the pier with the save crystal under water. The note on the dead body you find quickly after following the Beast into the cave. Listen to all radios in the game. The radio on the chair near the trailer at the coast line to the left of your starting position. The radio in front of the tent of Jenny, the woman who tries to run away from you to her yellow car when you try to kill her. The walkie-talkie in the house on the hill. The radio in the farm house where you kill the wolf. The radio in the tent on the camping site on the right shore of the river. The radio in the fire tower on top of the hill. Kill a snake, dog, boar, wolf, owl, and bear. For this achievement you'll have to kill a few different animals in both chapters. Dog: The dog can be found barking at you at the cave entrance on top of the hill. You can just stab the dog to death. This is the only dog in the game, so you'll have to kill this dog before ending the first chapter. Snake: Snakes can be found in many different spots on the island. A snake you can easily stab to death is located at the left backside of the lighthouse that you can find on the coast line. If you fail to kill a snake in the first chapter, no worries: there are also snakes to be found in the second chapter. A snake you really cannot miss in the second chapter, for example, is the one guarding the bridge near the caravan where you start the second chapter. However, this snake doesn’t appear at the start of the second chapter. It appears after you have completed the quest where you have to kill and inject three animals. At the end of this quest, you wake up from an alarm at 3:00 am in your caravan. If you walk to the bridge after you hear this alarm, the snake will be there. Boar: Has to be killed for a quest. The boar can be found in the canyon underneath the bridge which you have to cross to leave the starting area with your caravan. Wolf: Has to be killed for a quest. The wolf can be found in front of a farmhouse near the right side of the big waterfall. Bear: Has to be killed for a quest. The bear can be found near the pier with the save crystal under water. If you walk straight ahead with the lake on your left, you’ll find a sign which says: "Cave”. The bear lives in the bushes behind this sign. He can be killed with two shots from the rifle. Owl: This animal is easy to miss because it can fly away. The owl is located in the same area as the bear. There is a dead woman laying on the ground in this area (presumably attacked by the bear). She’s easy to find as her flashlight makes her location light up. On the tree trunk behind this woman sits an owl. It flies away if you get too close, but you can easily shoot it from a distance using your rifle scope. For this achievement, 8 alien skulls have to be found and interacted with (by pressing E). At the moment, I only have found 5 of those skulls, so I’m still missing 3 of them. If anyone has found these missing skulls, please let me know, so I can add them to this walkthrough. The first alien skull of the first chapter of the game can be found in the Shadows Cave. This is the cave that is guarded by the dog on top of the hill with the house on it. At a certain moment, you get to a point where you need a lighter to ignite some dynamite. To get this lighter, you have to fall down from a cliff in some water. On the left side of this water, you find the lighter. On the far right side is an alien skull guarded by a shadow person. The second alien skull of the first chapter of the game can be found in the water underneath the bridge leading to the house on the hill and the cave. It is however as far as I can see impossible to interact with this alien skull, but you can see it under water. The third alien skull of the first chapter of the game can be found on the small peninsula inbetween the dying whale and the coast guard building. On this peninsula there are two huge rocks with a small opening between them. The alien skull can be found on the ground in this small opening. The first alien skull of the second chapter of the game can be found directly at the beginning of this chapter. There’s a pool of water near the caravan where you start out. In this pool of water you can find a broken car. On the right side next to this broken car an alien skull can be found. The second alien skull of the second chapter of the game can be found in the cave that you have to enter when you try to find the Beast after it flees from you when you first started fighting it. At a certain point, you will jump from a height into some red water on top of a dead deer. Directly after that, you’ll get attacked by four aliens. After defeating them, look at the left side of this huge room. You’ll find an alien skull directly underneath the water surface near the left wall.